This was the last book I read in March: I left my review at the end of the month sitting in the Shiny New Books publishing queue and here it is, published today. 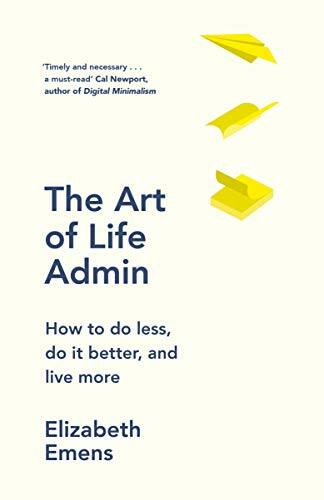 Elizabeth Emens’ “The Art of Life Admin: How to do less, do it better, and live more” takes as its topic the office-type admin you have to do AROUND chores (so choosing a new dishwasher but not loading it; arranging play dates but not overseeing them), how people face them, and the different styles people have around life admin and how we can learn from these styles. It’s well-researched and referenced and has a list of handy hints at the end to save the admin of marking them up and noting them down: a nice touch. Oh, and it made me Say Something to my husband! Thank you to the publisher Penguin / Viking for sending me a review copy in exchange for an honest review in Shiny.